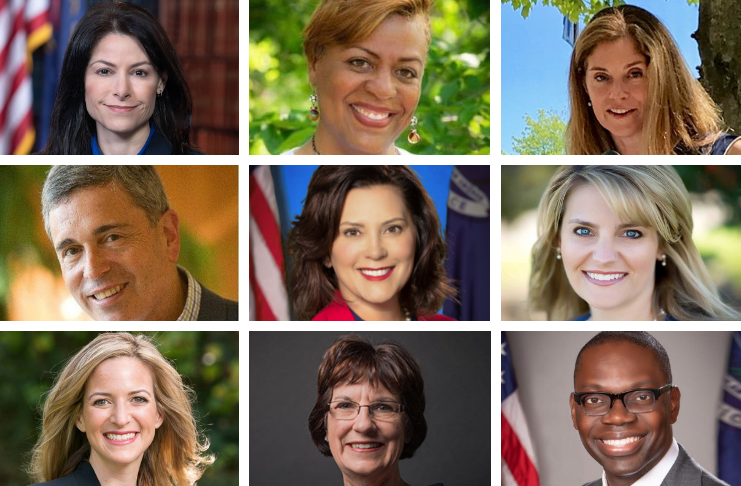 (top): Dana Nessel, Kim Trent and Bridget McCormack; (center) Ron Weiser, Gretchen Whitmer and Casandra Ulrich; (bottom) Jocelyn Benson, Dianne Byrum and Garlin Gilchrist. It may look like the “Brady Bunch” from the photos above, but that’s actually a look at Michigan’s current roster of statewide elected executives. Not to put too fine a point on it, but only two of the nine leaders are men. Two are people of color. One is LGBTQ. And only one is a Republican. That’s a sea change from where we were at before the 2018 election when seven of 10 statewide elected leaders were men (the extra slot was due to a co-chairing arrangement for the State Board of Education). Eight are Republicans. And there was one person of color. (top): Brian Calley, Sandra Hughes O’Brien and Bill Schuette; (center): Ruth Johnson, Rick Snyder and Andrew Richner; (bottom): Brian Breslin, Casandra Ulbrich, Richard Zeile and Stephen Markman. Today, Michigan is the only state in the nation with women in four top executive positions, as the Advance has reported: Gov. Gretchen Whitmer, Attorney General Dana Nessel, Secretary of State Jocelyn Benson and Michigan Supreme Court Chief Justice Bridget McCormack. Lt. Gov. Garlin Gilchrist is the lone male of the bunch. But last year’s “pink wave” on the Democratic side spread down-ticket, too. Of the four statewide-elected education boards, three are now run by Democratic women. Casandra Ulbrich chairs the State Board of Education, Kim Trent* leads the Wayne State Board of Governors and Dianne Byrum is head of the Michigan State University Board of Trustees. University of Michigan Board of Regents Chair Ron Weiser has the distinction of being both the only man and only Republican to lead an education panel. He just stepped down as Michigan Republican Party chair and was succeeded on Saturday by former state Rep. Laura Cox. In the new class of leaders, Gilchrist and Trent are both African-American. Nessel is the first openly gay statewide official in Michigan history. Before the last election, three of the four top executives were men: Gov. Rick Snyder, Attorney General Bill Schuette and Supreme Court Chief Justice Stephen Markman. Secretary of State Ruth Johnson was the only female. Rounding out the group was another man, Lt. Gov. Brian Calley. As for the state boards, men held three of the five top positions, as did members of the GOP. Republican Brian Breslin chaired MSU’s board; Republican Andrew Richner led the U of M body; and Democrat Sandra Hughes O’Brien headed Wayne State’s board. The State Board of Education was split between the parties, so Ulbrich, a Democrat, and Republican Richard Zeile had a power-sharing arrangement. O’Brien, who is Latina, was the only person of color of the 10 leaders. None identified as LGBTQ. “Representation matters” was a mantra for many Democrats in 2018. In Michigan, it’s pretty clear that it’s made a difference. * In the interest of full disclosure, Trent is married to Advance Reporter Ken Coleman.